Prices for sails to 1 ton, 1/2 ton, 1/4 ton, 10 Meter Type, 10 Metre R, 1006, INT, 11:meter ONE Design, 11:metre, 12 Meter Type, 12 Metre R, 14 Foot Dinghy, 2 ton, 2.4 Metre R, 3/4 ton, 4.4 Meter, 40' Yacht, 420, 470, 5 Metre, 5.5 Metre, 50 m2 Krydser, 50' Ocean Racer, 505, 6 Meter Skandinavisk, 6 Metre R, 60' Yacht, 606, 7 Metre R, 707, 717, 8 Meter OD, 8 Metre R, 806, 9 Metre R m.f. sailboats. Resen Sails. Pricelist for sails and lazybags/lazyjacks. If you can't find your boat below, you can use our online sail calculator. 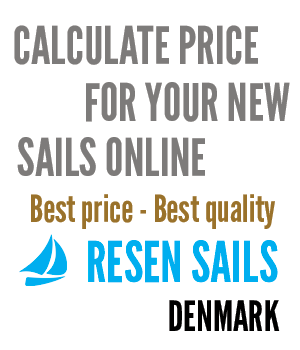 With our calculator, you can also configure your sail for your specific needs.